Wash apples and dry thoroughly. They need to be totally dry for the caramel to stick. Combine all ingredients except apples in a heavy saucepan. Stir continuously with a wooden spoon or spatula over medium heat until sugar dissolves completely and butter is melted. Increase heat to medium-high and cook caramel at a rolling boil. Continue to stir slowly until a candy thermometer registers 236°, or until a spoonful of caramel dropped in a bowl of cold water forms a firm little ball. Pour caramel into a metal bowl and cool for 5–10 minutes. While caramel is cooling, line a baking sheet with parchment paper. Push a chopstick into the stem-end of each apple. Holding the chopstick, dip apples one at a time into the caramel, submerging all but at the very top. Lift each apple out, allowing excess caramel to drip back into bowl. Turn and hold for several seconds to help set caramel before setting apples on prepared parchment paper. Chill apples on sheet until caramel partially sets (15 minutes). 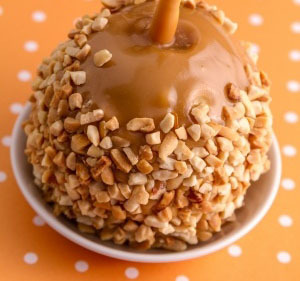 If desired, roll caramel-coated apples into chopped peanuts or other coatings. Or drizzle with melted chocolate. Chill until decorations are fully set (about 1 hour). Enjoy right away or cover and chill for up to 1 week!